Appearance of Crosses 2016-4, 2016 Signed and dated on verso. Appearance of Crosses 2016-8, 2016 Titled, signed and dated ‘”Appearance of Crosses 2016-8″ Ding Yi 2016’ on centre verso. Appearance of Crosses 2016-7, 2016 Signed and dated on verso. 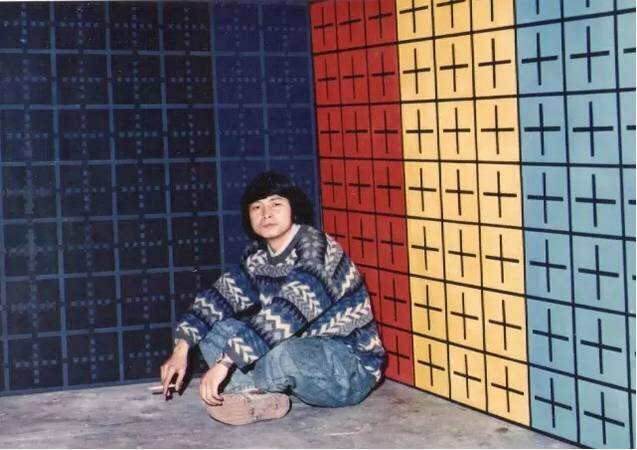 Ding Yi, one of China’s most constant and collectable artists, is exhibiting for the first time in London. 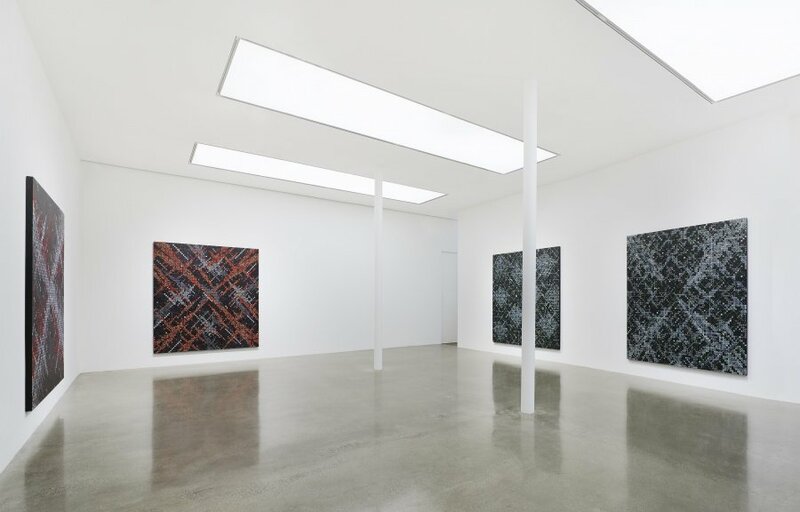 The Timothy Taylor Gallery presents canvases painted last year in his abstract series Appearance of Crosses, which he began in 1988. He talks to CoBo about the road his art has taken and his home city of Shanghai, and he offers opinions about the contemporary art world and David Hockney. Ding Yi was born in 1962 and in the 1980s studied decorative art at the Shanghai Arts and Crafts Institute. He participated in Shanghai’s avant-garde New Wave movement and in street performances, an artistic format that was unprecedented at the time. Xs and +s first appear in Taboo (1986), a canvas influenced by Cézanne but with the textured energy of cubists like Braque. 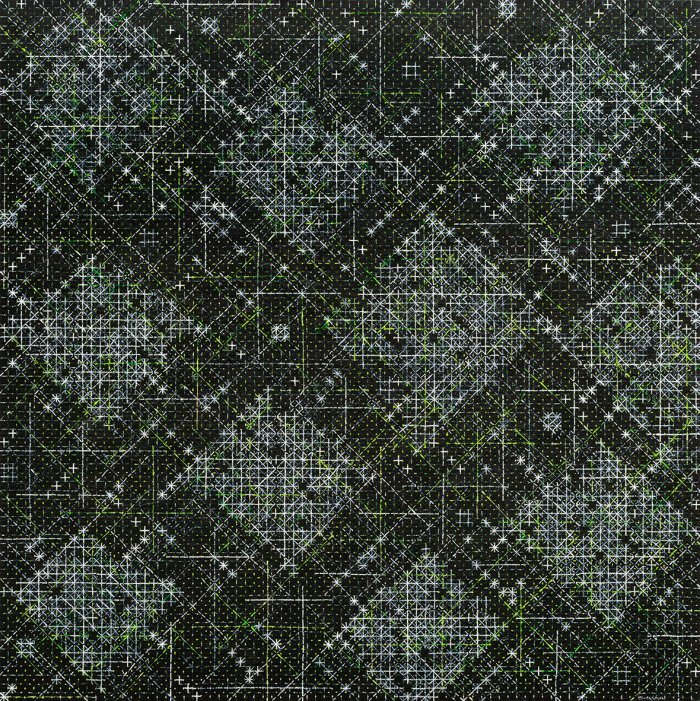 In 1988, his compositions of crosses became ordered into grids and have evolved recently to reflect a sense of Shanghai’s urbanisation. His paintings are now in museum collections worldwide. 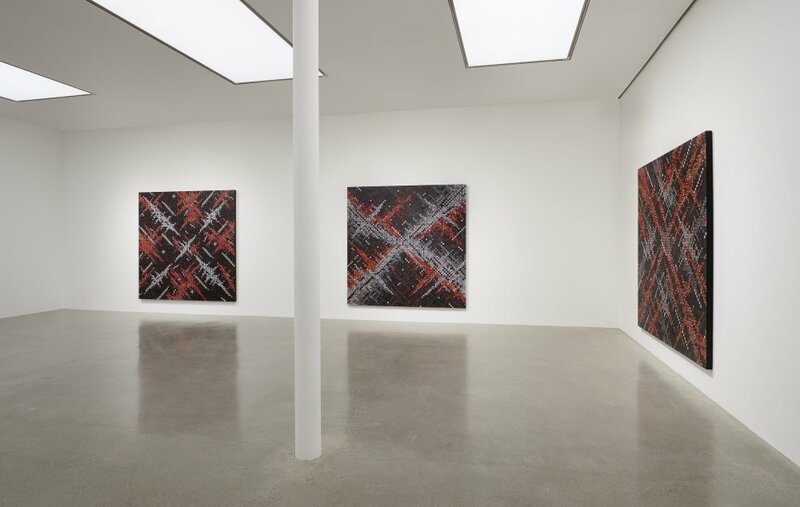 At the Timothy Taylor Gallery in Mayfair, seven 2.4m square paintings are shown in the order Ding Yi painted them. 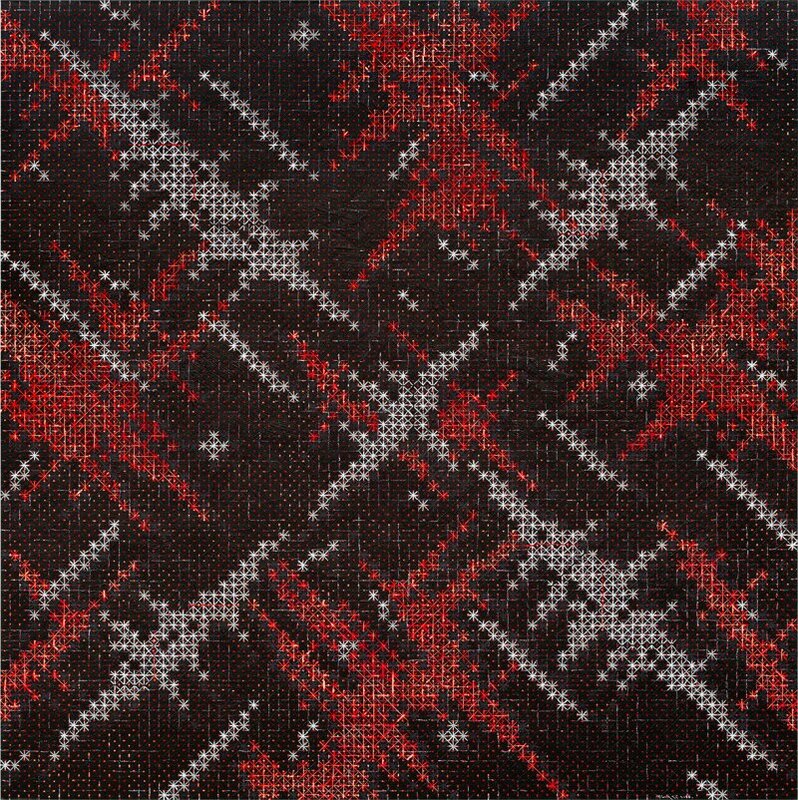 Four weave green into the palette, three carry a bold red, and all are signed in a backwards-leaning Western script. Before the opening, Ding Yi, dressed in a dark suit and white shirt subtly splashed with yellow, spoke to CoBo through an interpreter. You have childhood memories of Cultural Revolution, and you once said “growing up in a highly politicised environment, you get tired of it and you’d rather not express it”… Does this still hold true, and is it why you art is abstract? Yes, I am part of a generation of artists born in the Cultural Revolution, and that generation fall into two categories. Some choose to give voice to all that was happening. Others, the category that I fall into, avoid letting that into their creative practise. I don’t want to be an artist who is about his own personal beliefs, I want to be someone who creates some new artistic possibilities. Was that the case in the 1980s when you were part of the ‘New Wave’ in Shanghai, and your performance art then? Were not those in some way expressive reactions to the Cultural Revolution? You’re talking about works that I did in my student days, and people try out all sorts of possibilities. From 1988 onwards, although I had not yet graduated, I became aware of a certain amount of art and art history and I decided I wanted to forge my own road. I began to paint my series The Appearance of Crosses and I’ve since then not tried any other disruptive variation in stylistic terms. In 1986, you painted Taboo, a chaotic, organic composition with Xs and some +s. Is it a clue to the direction you would subsequently take up? Of course the symbols used in that work from 1986 to some extent gave a clue to my future direction, but the meaning of those signifiers was different to anything I did subsequently. If you take an X on its own, that in itself has meaning, it’s generally seen as a No or denying something. The way I used it in 1986 was totally different to how I developed the meaning from 1988 onwards. There was a lot of texture in Taboo, which has passed to the current paintings. Would you agree? The 1986 is a more of a natural, instinctive work, it’s unadorned and it’s not the product of a great deal of reflection. What happened subsequently from 1988 onwards was an oevre within which I imposed certain limits on myself in order to shackle some of my instincts. I set myself goals. I wanted to become a rational abstract artist, one producing detached works, because that’s what I felt was absent in traditional Chinese painting. So I consciously maintained certain approaches from 1988 onwards. Those early works were a kind of declaration to my fellow artists that this is the road that I will now be following. Piet Mondrian’s paintings are abstract but also respond to street grids (in New York). Do your paintings respond to Shanghai in a similar way? Piet Mondrian’s works certainly were inspiring to me, in particular the purity of his minimalist approach with the use of the grid to show us the world as he saw it. Going back to the declaration that I made in my works, the strongest motive was the power of the purest possible artistic approach. Particularly in my early works, I purposefully eliminated any trace of the human creator. I produced them entirely with tools, so you would not see any emotional elements, brush strokes and so on, in order to give vent to a kind of force that humankind couldn’t control. 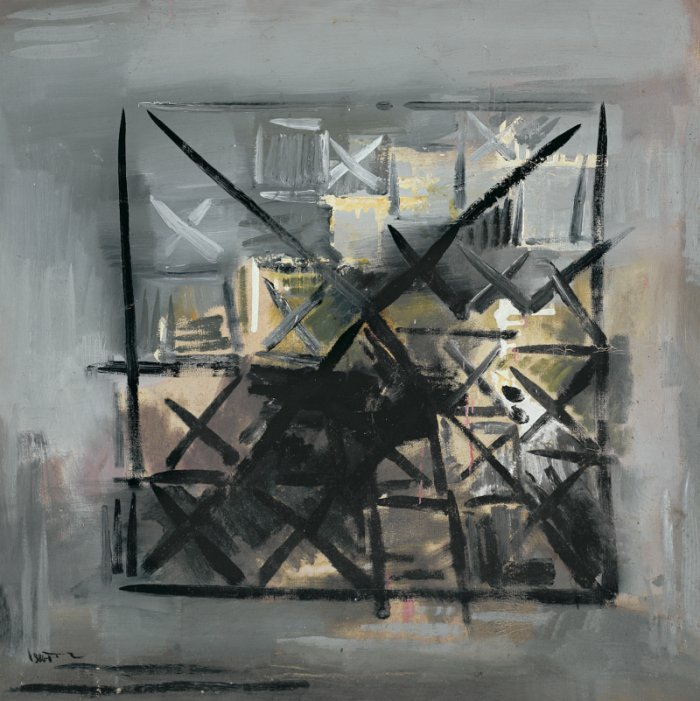 The direction was clearly set – I was to be a formalist abstract artist, one seeking purity and completely separated off from society, longing for a free-standing artistic system in which I explored the question of form . Later on, in 1988/89, I began to be attracted to the developments in the city of Shanghai, so I began to have more of a relationship between my artistic creation and the city. If you lived in Hong Kong or New York or London, would your art be different? Very likely. In my case, the attention I started paying to Shanghai’s urbanisation process was that the sheer intensity of the process forced you to pay attention to it. Streets that I knew from my childhood years would become completely unrecognisable. What do you think of the art market now- very global, with big money, big museums, big exchanges happening? Definitely different. Thinking back to when I started with the series called Appearance of Crosses, at that time we simply didn’t know about there being an art market as such. I and my peers were not aware that works of art were actually bought and sold. There was no real modern art museum in existence, and modern artists would exhibit in informal spaces or venues instead. There were certainly no galleries to represent you, and we simply did not have the social institutions in place for any of this to work. Fast forward thirty years and it’s the most commercial period ever for the art world. It’s become a major type of recreation for a lot of people. Certainly the population that we’re dealing with as modern artists is several times the size it was in the 1990s. This is a great big landscape and everyone’s really excited. At the same time the pace seems to be constantly accelerating and that causes me to stop for reflection. The way they are hung here is how they were in my studio, which is slightly larger. There is a chronological order, clockwise. They form a time sequence. (In Appearance of Crosses 2016-4) I reconstituted the diamond. (Appearance of Crosses 2016-8 is) dissembling, (in Appearance of Crosses 2016-9) we have a large cross, [with] something like flames off it. 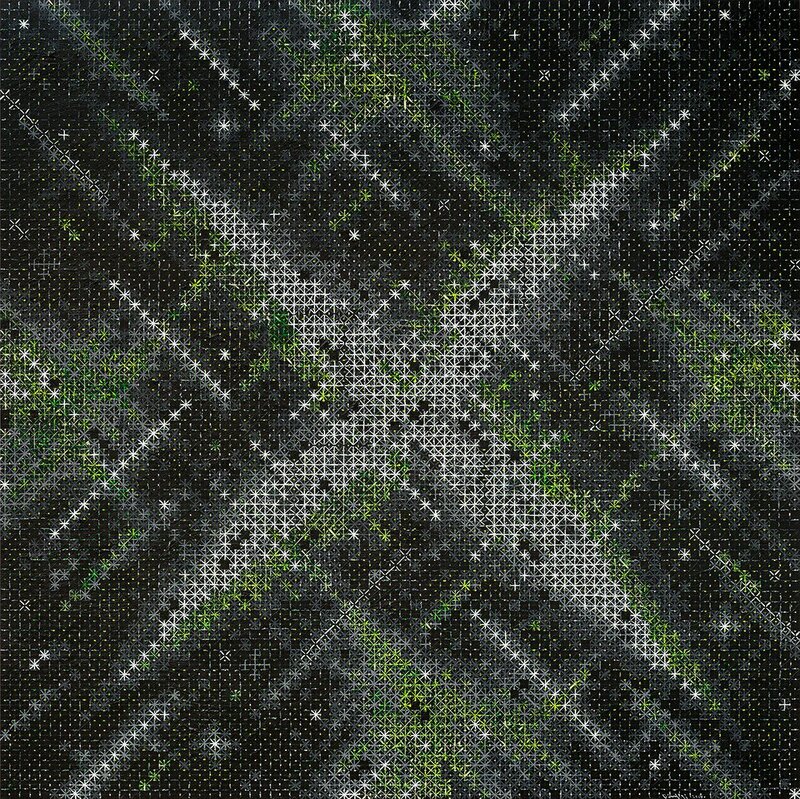 The overlay of whites and greens or white and reds suggests a third dimension. You are not wrong. My early works were completely flat, then I introduced a limited depth. In London, have you checked out, for example, the David Hockney show at Tate Britain? I was there two days ago. Clearly the UK government and the modern art world want to build up David Hockney as a hero of our age. What I like most about the exhibition, nevertheless, was the California series. Ding Yi’s extraordinary dismissal of Hockney as hype is unexpected, and it can’t be just because Hockney famously mocked abstraction in his hyper-realistic abstract-looking Rubber Ring Floating in a Swimming Pool (1971). But Ding Yi has chosen an abstract ‘road’, and with his crosses, ‘not tried any other disruptive variation in stylistic terms’. It is long, but not winding, road. 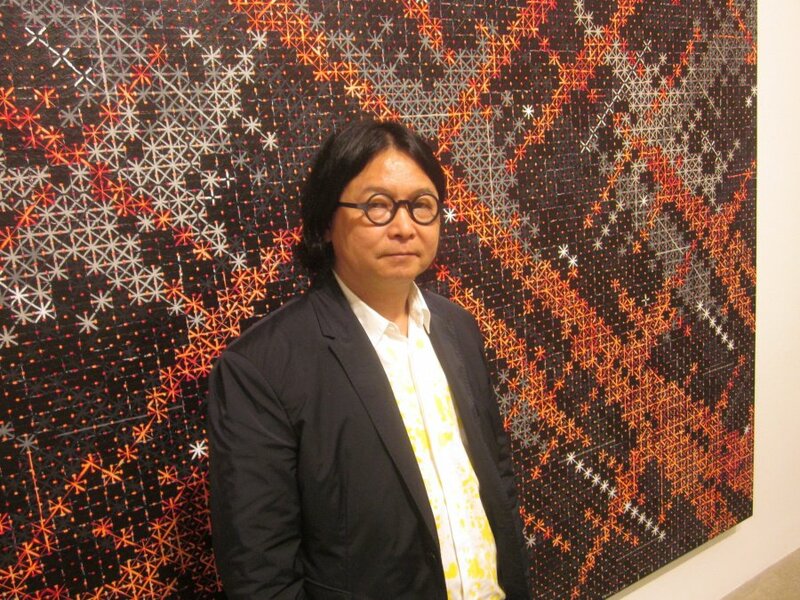 This makes him very different from artists such as his older friend the great Yu Youhan, whose paintings started as abstract but who pioneered Political Pop, or say Zeng Fanzhi, who this century has reinvented himself in breath-taking large expressive canvases (and like Ding, was born in the 1960s). Even Malevich, the ultimate abstract reductionist with Black Square (1915), moved on from his abstract Suprematism. As Ding Yi says, the X can be seen as a symbol of denial. After almost three decades, his Zen-like denial of the personal as well as of new elements beyond the X, remain resolute.